Trying to understand the economy is tough business. Publishing your predictions about the economy on the web is even more difficult. So I was surprised when I came across a paper on economy.com’s website titled, “The Economic Impact of the American Recovery and Reinvestment Act” and noticed this chart. The graph in question was taken from page 13 of the paper, written by Mark Zandi. It’s also featured on his homepage, here. Dr. Zandi is the chief-economist and co-founder of economy.com with a knack for verbally explaining complex things so clearly that non-economists can understand them. He is often heard on NPR and quoted in the WSJ and NYTimes weighing in on the economy. I’ve followed his career for over 15 years and respect his insights and success. It is out of that respect and admiration that I critique this graph. 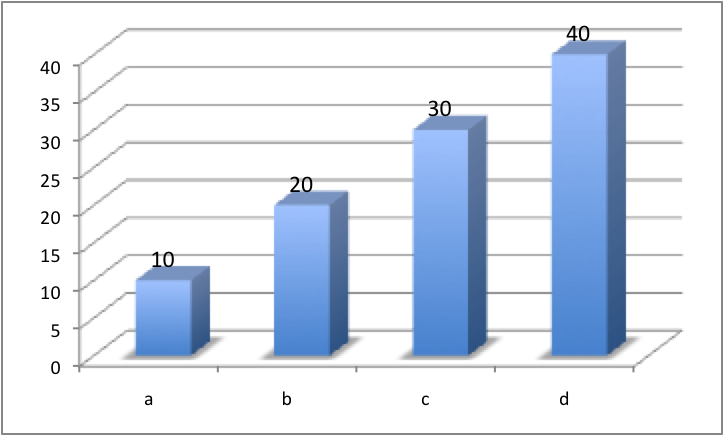 Bar charts must have a zero-based axis because we use the length of the bars to compare one bar to another bar. By breaking this rule economy.com’s unemployment rate chart makes it look like the unemployment rate will increase 6 fold from 2008Q3 to 2010Q4 without the stimulus, when in fact, the estimated increase is from roughly 6% to 11%, less than a 2x. 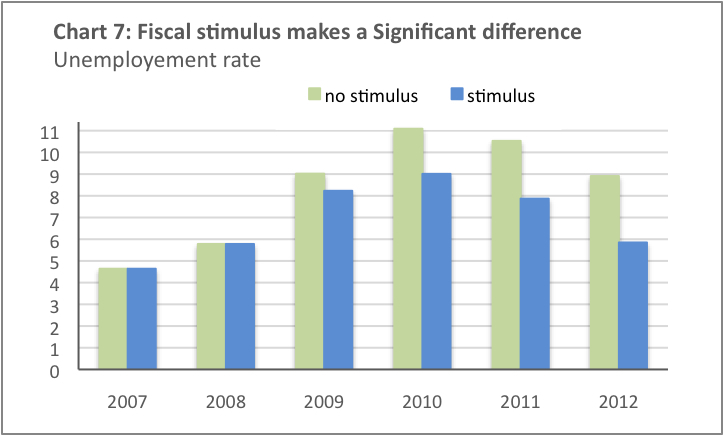 The lack of a zero baseline also adds a false visual comparison between the ‘economic stimulus’ and ‘no economic stimulus bars’. For that let’s look at bars in 10Q4. 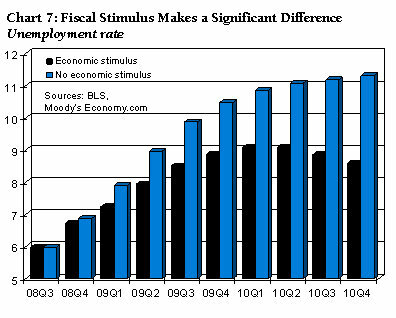 The ‘no economic stimulus bar’ (blue bar) is about 11.2% versus the ‘economic stimulus’ (black bar) of 8.5%. The actual difference between the two percentages is 1.3x, but take a look at the length of the bars and the difference appears to be 2x. I know Dr. Zandi had good intentions when he went with 5 as his starting value on the Y axis. His intent was make the chart better show the trend over time, but in using a bar chart to display the data, he choose the wrong chart. What should he have used? Read on. The second visual lie being told here is caused by the third dimension on the graph. Can we tell what the unemployment rate is expected to be in Q4 of 2010 with and without the stimulus? Looks to me like the no stimulus unemployment rate is expected to come in at 11.2% and the unemployment rate with stimulus is expected to be 8.5%. The angling of the Y axis makes it hard for the eye to track over to the value of the bar. To add insult to injury, the angle at the top of each bar makes it difficult to figure out where the ending value of the bar is. Should we reference the front side of the bar or the backside? Unfortunately, the corresponding data this graph is drawn from are not available from economy.com, so we can’t tell for sure where the points are. But we can try a little experiment. I whipped up the chart on the right using MS Excel 2007. The values for A, B, C, D are 10, 20, 30, 40 respectively. I’ve added the actual values to the top of each bar to make it a little easier to read. This 3D chart is actually insightful because it illustrates a serious problem with 3D charts–the bars misrepresent the data. Column D should line up with 40, but it doesn’t, it’s more like 38. If you’re telling a story as important as what’s going to happen to the economy after spending nearly $800 billion in taxpayer money, you should stay away from 3D bar charts because they tell lies about the data they represent. And that brings us to the final flaw with this chart. Bar charts are generally best used for categorical or grouped data. For time-series data we usually want to go with a line chart, not a bar chart. The lines in the line chart help our eyes see trends in the data better than the individual bars in the bar chart. Line charts also allow us to start from a non zero baseline which allows the graph’s creator to show the trend by setting the min and max values slightly above and slightly below the max and min values of the data. Lastly, I chose a soft, somewhat natural color pallete to draw these charts. They’re much more pleasing to the eyes than black and blue. Excellent critique. But the worst problem is that the “data” are mostly projections, which we now know were way off. 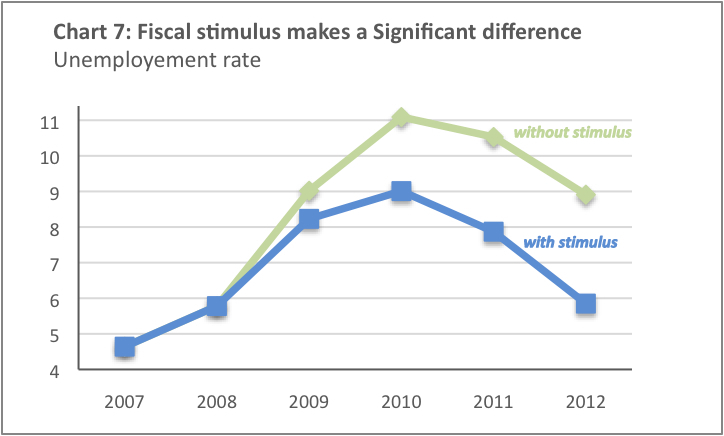 The title of the chart, “Fiscal Stimulus Makes a Significant Difference” implies that the chart represents factual information. Projections should be labeled as a such, and there should be a graphic distinction between historic data and projections, with solid colors for historic data and something lighter for projections. There are even murkier categories, such as data for unknowable alternative histories (4Q08, no stimulus) and perhaps historic data that was not yet available but had to be estimated. You are absolutely right Win. Thanks for the comment! In fairness to Dr. Zandi, I took those titles straight from his work.